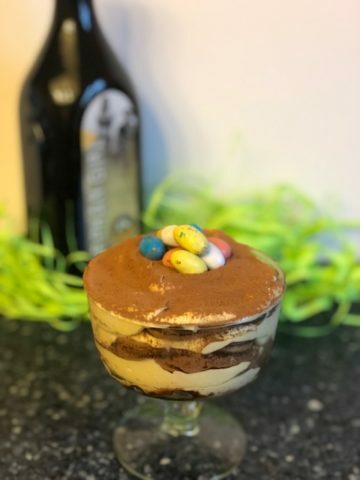 Tiramisu, a classic Italian dish, is a layered dessert with mascarpone cheese, egg yolks, whipped cream, cocoa powder, and coffee dipped cookies. Translated, Tiramisu means, “cheer me up” or “pick me up” and that’s exactly what this dessert does. 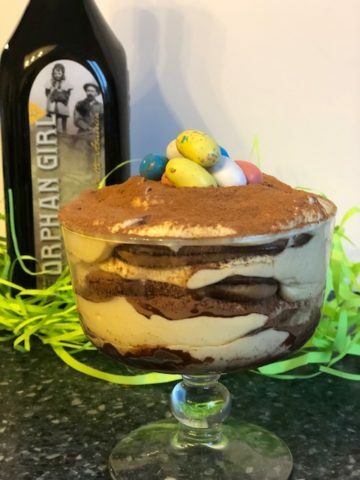 Now in true Headframe Spirits’ fashion, we took this classic dish and made it our own, infusing our Orphan Girl Bourbon Cream Liqueur into the recipe for the perfect Easter brunch dessert. This is an easy recipe to make. First, decide if you want to make one large Tiramisu or mini tiramisu cups (like the one we made). For the large Tiramisu, use a 9-inch springform pan and line the bottom with parchment paper. For a smaller Tiramisu (still enough for two), use 4-inch trifle dishes, they are usually sold in packages of 4. In a Kitchen Aid or a large bowl with a mixer, beat your egg yolks with 1/3 cup of sugar. Continue to mix it until the dark yolks turn a light yellow color and the mixture doubles in size. Place this mixture into a separate bowl for later. Next, beat your heavy whipped cream until it starts to thicken, then add the remaining 1/3 cup of sugar and the teaspoon of vanilla. Continue to mix until stiff peaks form. Add your mascarpone cheese and allow the mixture to fully combine. Take your yellow egg batter and gently mix it (use a spatula, not a mixer) with your whipped cream. Now in a shallow bowl combine your chilled coffee and Orphan Girl Bourbon Cream Liqueur. You are ready to start assembling! In your container of choice (trifle dish or springform pan), sprinkle your unsweetened cocoa powder using a fine-mesh sifter, until the bottom is evenly covered (about a Tb. worth). Take your Milano cookies and dip them into your coffee/ Orphan Girl mixture. Be sure to get them nicely coated. Then evenly place the cookies on the bottom of the pan. Take a large scoop of your whipped cream and egg batter and place into on top of the cookies, spreading it evenly over the surface. Dust the layer with your unsweetened cocoa powder again, then restart the process. Dipped cookies, whipped cream, cocoa powder… until you reach the top of your cake pan. Finish with some festive chocolate eggs then refrigerate for at least 4 hours. Serve with a small glass of chilled milk and Orphan Girl. Cheers! Headframe is taking on the big boys Butte-style. When you're in Butte swing by the Distillery and introduce yourself. We love getting to know the folks who share our passion. Cheers, John & Courtney.